Do you know how to handle incoming telephone calls so that they do no waste your valuable time? It is a fact that Inbound telephone calls can consume a great deal of time and eat into your productivity level by taking you away from tasks that are more profitable. There are ways of cutting down the time you lose speaking on the phone, without being curt or rude to the person calling you. 1. Have your calls answered and possibly screened by a live professional receptionist. Let her or him route the calls to the right person, department or extension. For some calls, such as those from salespeople looking to sell your business a product or service, those calls can be sent to a voice-mail extension to be reviewed later. You can even have an extension with outgoing messages for general questions such as hours of operations and locations. Even if your business is a home-based business, consider using a virtual office service that answers and re-directs your business calls. 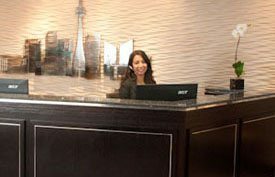 Having a professional live receptionist answer your business calls not only sets a professional tone for the caller, it also gives you options of what calls you want to have transferred to your home or cellphone number. A good receptionist is also a good call screener who knows when a caller asks for a person by their title or job function and not their name. This is most likely a sales call that can be transferred straight to voice mail and not be a waste of your time. 2. Prioritize the call as you speak. When a call does get transferred to you, you need to decide if the call can be quickly dealt with, or requires you to look into it and get back to the caller at your convenience. Trying to deal with complex, time-consuming calls on the fly may not be good for business or the management of your time. Offer to take the callers’ information and ask when it might be good to get back to them with the answers they are looking for. 3. Keep the call on track and on task. We have all had those calls where the caller tries to get friendlier, or starts to stray into a social conversation rather than the business at hand. Your job is to keep it on track and not allow the call to become a time-waster or a distraction. Do not be afraid to paraphrase the original question to steer the caller back to reason for the call in the first place – so that you can keep it professional and get it dealt with quickly. 4. Develop methods of closing a call. Even after a resolution or desired outcome of a call has been reached, some callers may go into a loop and want to repeat the facts and/or the reasons behind the call. You need to summarize what was agreed upon and the follow up (if any) that is needed, and not let the conversation get repeated. 5. Keep notes on what was discussed and what conclusions were settled on. The next time you speak to that caller, you do not want to waste time hearing their entire story once again. You want to take control of the subsequent call and keep it as brief as possible. This means you stating the facts behind the original call and taking control of any subsequent time on the phone. 6. Can you email that information to me or fax that document? Sometime the reasons for a phone call can be better understood when it is put in writing, or you are presented with documents that will give you a better understanding of the call. Offering the caller an email or fax option can be a real time saver, even if the discussion still needs a follow-up phone call. This option allows you to review the email or faxed documents, and have your answers available in a reply email or a quick follow-up telephone call, thus saving you a lot of time. The purpose of having a phone for your business is to have a communications tool to help your business; not a device that takes up time that you could have spent more productively. Learn to master inbound calls and you will notice that your productivity will increase, rather than becoming a ‘slave’ to answering your phone. What is Your Guilty Pleasure During Breaks at Work?